Basil Manossa — The Trucker Predator Online Pervert!! THE DIRTY ARMY: This man has been inboxing vulgar language to myself and other ladie’s while being a married man. He’s on the downside of his 2nd marriage. His first marriage failed because he was a women beater….his current marriage is in horrible shambles. 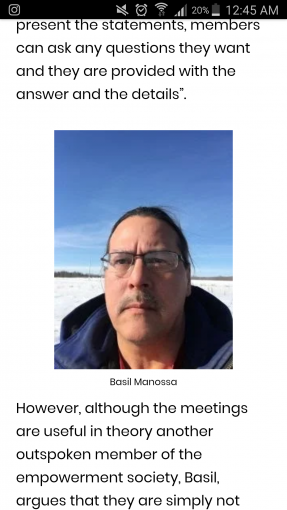 His current wife resides in calling lake while he lives in athabasca. This monster has gone to great lengths to destroy peoples lives. He started a basement newstand by permitting hatred propoganda in the community of calling lake. He has kids all over the country and meanwhile tries to act like he’s a community activist. In his writing and posts he commononly uses the word “”foli”” he has even wrote false slanderous information about people on this site and it only makes sense he gets a taste of his own medicine. He has tried to get into politics over the years but that career didn’t pan out ? so now he drives a truck and goes online in spare time to harass single older women and people online. This man has even faked a hungar strike to appear to be a hero! don’t fall for his scams because he go to great lengths to ruin your life. this is a piece of sh1t who will never work well with others or try to help his community. I hope many of you can share this and bring this monster to justice. The RCMP have already been notified for his antics and he has a long history. Stay safe people because this man needs help. ive scene this fella at the Jay before. Yup.